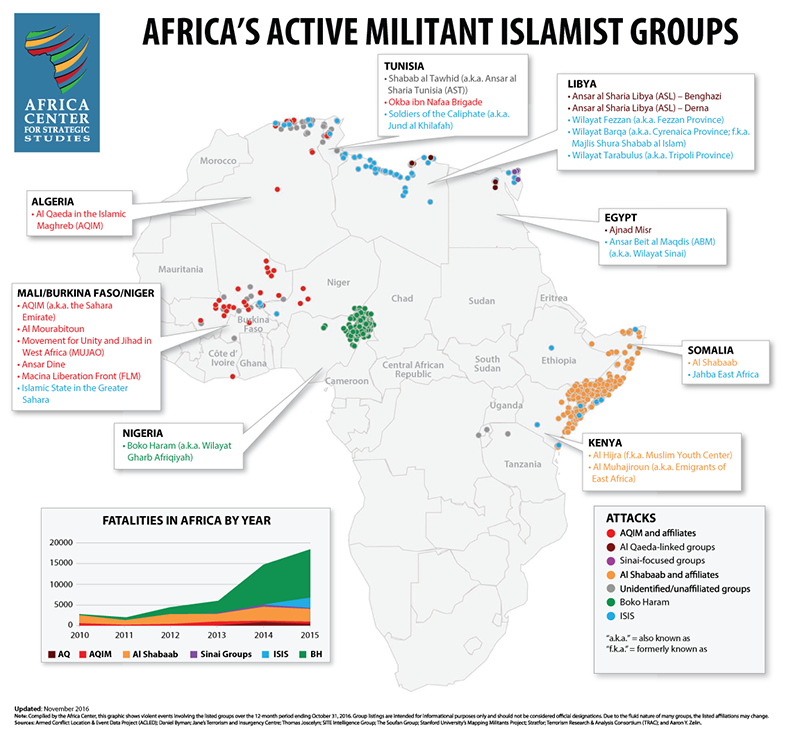 There is considerable variation in the number and type of militant Islamist groups active on the continent. Most of these groups’ activities are geographically concentrated. There is a local focus for the majority of these actors, even if they have declared a nominal allegiance to a global terrorist network. ISIS and Al Qaeda central have a limited independent presence in Africa. Events involving Boko Haram claim the vast majority of fatalities, a figure that has risen significantly in recent years. There has been an escalation in the number and geographic reach of violent events linked to al Shabaab over the past 6 months. This is an update of a map the Africa Center for Strategic Studies released in April 2016. It reflects events that occurred between November 2015 and October 2016.